I definitely use all three! Can't do without them - especially the hammer and block. I would love to try these tools. They really expand your options in jewelry making! It's just a matter of finding extra time to learn new skills. 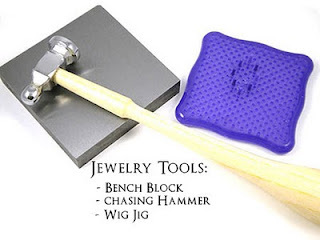 I can see how many of your designs would use these tools Pearl -their beautiful! Miss Val -I had my wigjig for oh, at least, 4-5 years before I picked it up and used it. And I agree about needing the time to learn the technique. I get new tools because I DO want to use them and incorporate them, but then it's the learning curve.